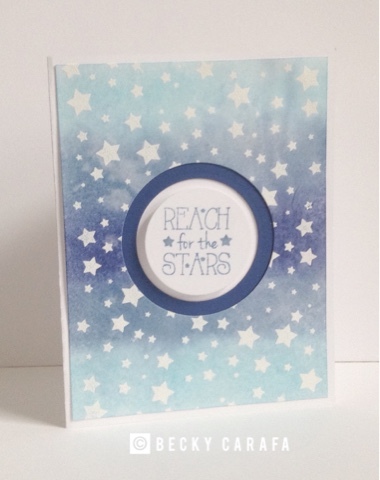 It's the final day of the Whimsy Stamps March release, I hope you've enjoyed the inspiration! Today I am showing you Shine Bright and Wish Upon A Star. I started by white embossing the star stamp from Wish Upon a Star on watercolor paper, then layering some distress ink on it before lightly spritzing it with water. I layered it on a dark blue panel after cutting out my circles for some reverse layering. I stamped the sentiment from Shine Bright on a white circle and popped it up in the middle. I added some sparkle to the stars on the sentiment. I adhered the whole panel to a white base.